With the Maldives being 99% water and 1% land, it’s no wonder that snorkelling is one of the best activities to do when on holiday here. Guests at Hurawalhi Island Resort can enjoy great snorkelling on the island’s house reef, but of course there is so much more to see around the Atoll. At Ocean Watersport Center, we are keen to allow our guests to explore more of the vast ocean life, which is why we have put together various snorkelling group excursions. Already getting to the different snorkelling spots is an adventure. Our comfortable speedboats skim across the waves as our guests relax to music, and before they know it we are approaching our first snorkel spot. In order to offer snorkelling experiences for everyone, trips run both mornings and afternoons, so even those who prefer to sleep a bit longer can join us. In the morning, we are exploring two nice reefs close by during a 1 ½ hour excursion. 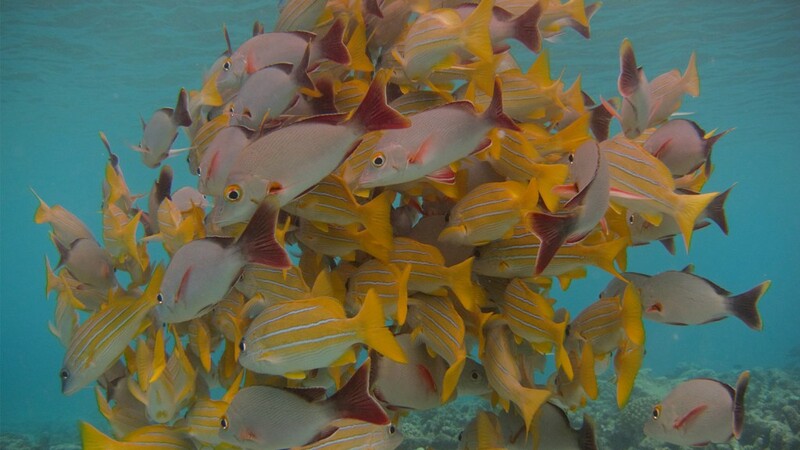 Our sister island Komandoo’s house reef provides one of the stops, as it offers a fantastic variety of fish life. The relatively shallow top reef where we snorkel is approximately 2 meters deep, which allows us to enjoy the astonishing and colourful fish close up. 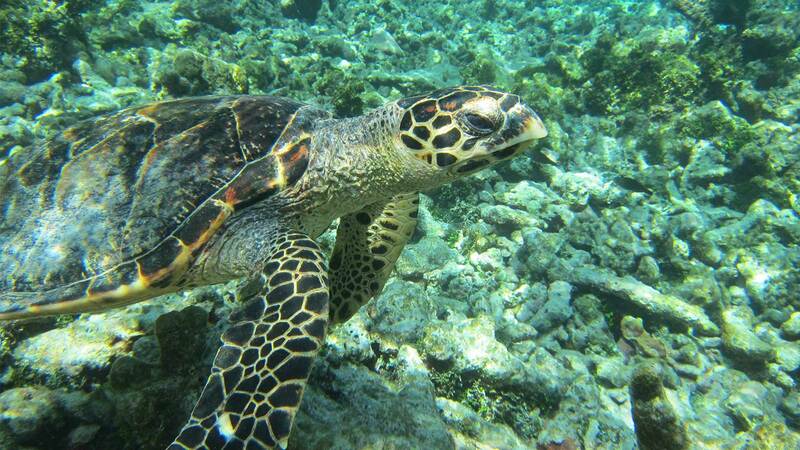 Various Hawksbill turtles have made their home there and often sit nicely relaxed on the reef. If turtles are your passion, you have to join us for our »Turtle Lovers Snorkelling Trip« in the afternoon. We take you to Kuredu Island Resort, our other sister island, where around 100 sea turtles have been identified living around the island and the surrounding reefs. In the shallow lagoon area, we can get very close to green sea turtles that feed on the beds of seagrass, not bothered at all by snorkellers. At Kuredu Caves, the so called “turtle airport”, you can see them swimming from their small caves along the reef wall as they come to the surface to take a breath. Turtles found on Kuredu can be massive and are simply beautiful to watch. Our guide Antonio found a previously unidentified turtle on this trip recently, and using a picture that focussed clearly on the pattern on her cheeks, Lisa, Hurawalhi’s resident marine biologist, was able to confirm it was the first sighting of this turtle. 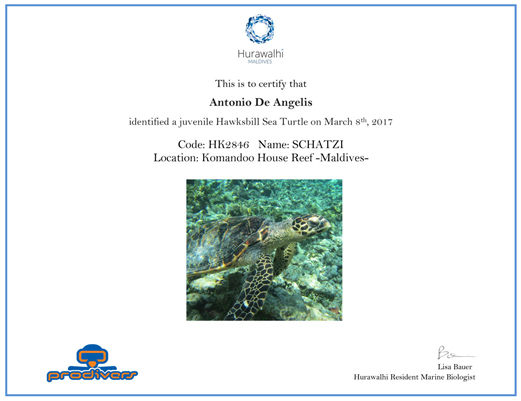 Antonio had the honour to name the turtle and called her “Schatzi”, meaning “darling” in German. Anyone who is able to help identify a turtle for the first time has the pleasure to suggest a name that will be registered with the national index. 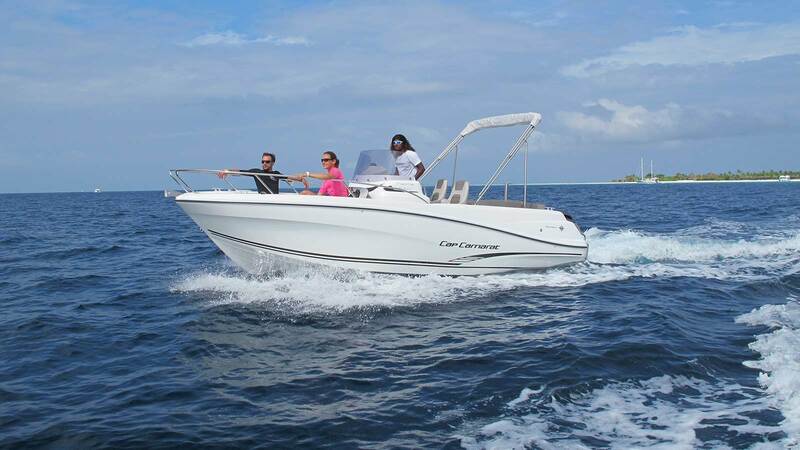 Of course, Ocean Watersport team are happy to offer our guests tailor-made, private speedboat excursions, which allow you to combine snorkelling, manta search, dolphin safari and many more all in one. Make sure you come and say hello at Ocean Watersport, and find out more about the awesome snorkelling options on Hurawalhi on your next visit.